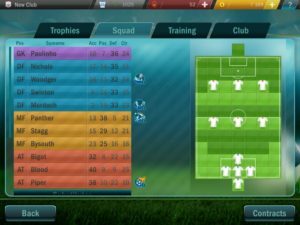 Yesterday I talked to you about a great game, Football Tactics (aka Soccer Tactics, for our friends over the pond) and today, after many hours of play time and victorious matches, I have decided to create this article where I will share with you my Football Tactics tips & tricks on how to better play the game, get the most out of your players and keep the fans happy by always winning matches. I am no Mourinho here, but I think that I did pretty well in the game (promoted from England’s amateur league with one draw and all wins, no goals scored against) and did the same from the fourth league – again just one draw and all wins, no goals scored against. Keep an eye on the energy levels of your players! Shown in the Squad menu (simply tap your club’s name and select the squad tap), the energy of your players is shown in their surname part: the lower their energy, the more their skills will be reduced. However, I saw that in the lower divisions your squad will have no energy problems – but it’s worth keeping this in mind for when things get tough! Control is also extremely useful for midfielders and attackers, to make sure that they hold on to the ball, but it’s best to focus on these main categories. Either way, your players will not only improve these when leveling up, but have a greater chance of improving them. Regarding the skills, you should not hurry: each player can learn a special skill ay any given time (but it takes 12 months to learn) and a second one is unlocked at level 60. Right now there are just 7 possible skills for your players to learn, and each unlocks them in a random order. So go through the skills of all your players and see if they can learn any useful ones – there’s no point in selecting “cannon shot” to your defenders, since they will rarely be in a position to shoot. Wait for the proper skill to unlock and only then teach it to your players. Finally always UPGRADE the just learned skill. The second level (which allows the players to use it twice) takes 18 months, so it’s a great idea to start the upgrade as soon as the players learns a skill – by the time the upgrade is ready, maybe you can learn a new skill! Attackers: Nutmeg or Rainbow Feint – these are both good in specific situations and it all depends on the positioning of your players. In the Training tab, tap the UPGRADE button in the lower right corner. 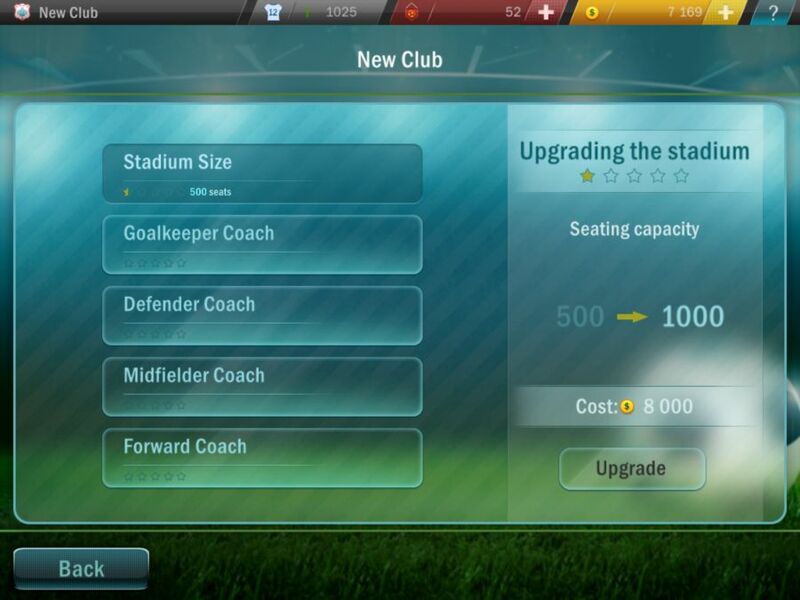 This gets you to a screen that allows you to upgrade many things in your club, but the most important thing to do is to upgrade to 500 seats as possible, to generate more income during the home games. I would suggest focusing on upgrading the stadium during the first few seasons. 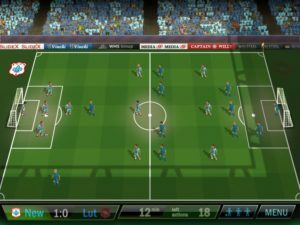 Using these Football Tactics tips and tricks, you will probably have no problem going on a winning spree and promoting three years in a row, so choose the sponsors that give you a lot of cash for promoting (but try to stay away from the #1 spot because… who knows?) If you think that you will have a long and tough season ahead, it’s better to play it safe and choose the sponsor that gives you money on a game-by-game basis. It is a lot easier to hold onto your own players than searching for new ones, especially since the top ones are insanely expensive especially early on in the game. 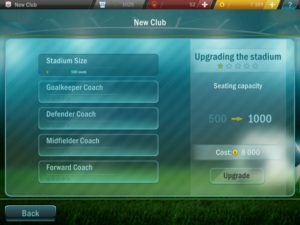 Renew your players’ contracts for 3 years – most of them will usually ask about 50 coins for 3 years, which is extremely cheap. Only sign new players when you can afford high quality ones. After playing a bit with different formations, I found that the tactic in the image above works best: the defensive midfielder is usually getting the man of the match award since he intercepts everything. He also has the long pass skill which helps us get back in business very soon. It is a really solid tactic and I recommend it from all my heart! If you are using the tactic that I suggested, every time your team kicks off, the central midfielder will have the ball. Pass it to the central striker (which should be your best striker), get past the central defender (if any) and shoot on goal. Usually, this ends up with a goal. Usually, there are two types of situations when you will start the turn and the ball is at your opponent: he either ends the turn with a “control” instruction – in which case you should simply ignore the player and focus on better positioning your team (if needed) or a regular end of a turn, where you should tackle and win that ball back. It’s that easy! Also, try to keep your defense tight and rarely spread it out – it’s better to have more players around to increase the chances of them intercepting the ball or deflecting it to one of your players. Maybe not always, but usually the best way to shoot is by shooting a precision shoot. Rarely a Powerful shot or cannon shot is better, so make sure you keep hitting them precision shots. Try to get your players as close to the goal as possible before shooting, in order to improve their chances of scoring. If you want to run the clock, it’s pretty simple: make sure that you end your turn with the ball in your possession and preferably with a “control” selected to increase the chances of you holding on it. Also, make sure that you perform all your three moves, since each move consumes time – so the more actions you perform, the less time your opponents have. Pressing is pretty strange and I never managed to make it work. Lofted passes will almost always be misses, so don’t try them either. Play safe, play to win! I never had players get injured or something, but I do like to substitute some of them every now and then to give a chance to my other players to improve their skills. I usually put them in striker positions when we are clearly winning, since they will get the chance of winning more experience this way. 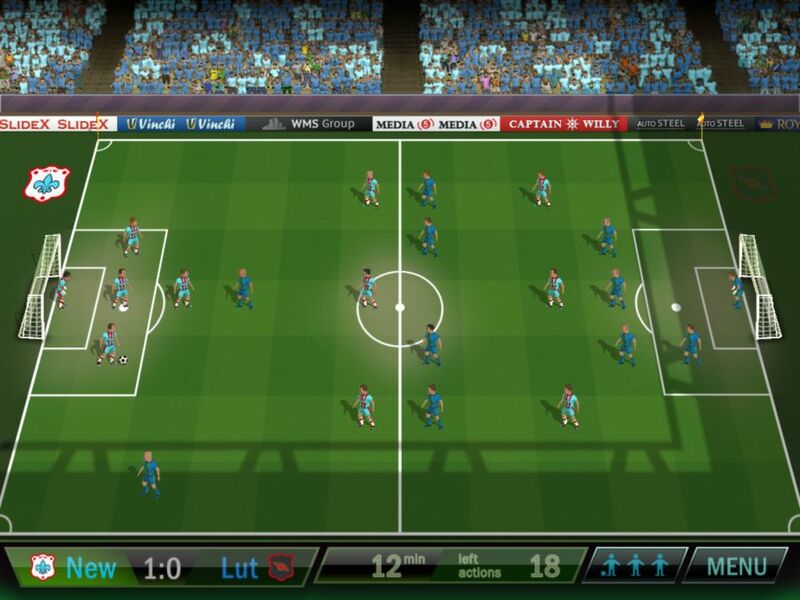 In order to make a substitution, tap the Menu button during the match and drag and drop players to their new positions. And this would be it for now, this is the strategy that I have used with great results in Football Tactics. If you have other suggestions and tips, please share them with us below.